Create high quality, custom made disc and spine labels to catalog your CD/DVD collections using free downloadable DesignPro software and predesigned free templates that work in over 100 popular software programs. Easily print your labels then apply to CDs or DVDs with any jewel case. Permanent adhesive labels are ideal for organizing digital photo albums, music collection and data backups. Spruce up your filing system with these Printable Hanging File Tabs. It's a cinch to create an attractive coding system for your files with free easy to use templates from Avery Design & Print. All that's left to do is print. 8 1/2 x 11 sheets for laser and inkjet printers. 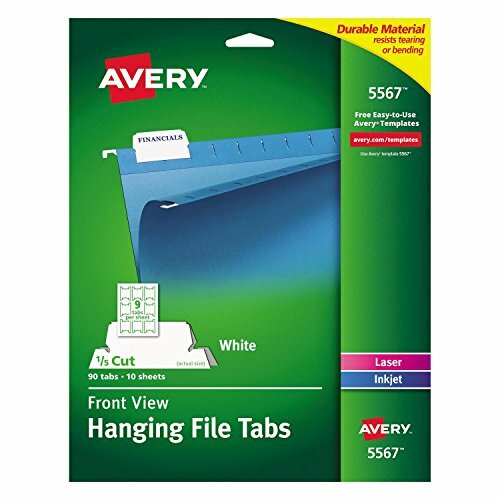 Sturdy tabs resist tearing and bending plus they feature a top-view design so you can find files at a moment's notice without using separate plastic holders. Here's looking at you, folders. Laser printer compatible. 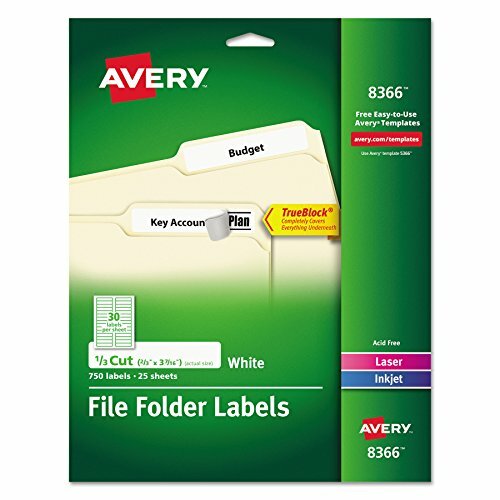 File Insert/Tab Type: Hanging Folder Tabs; Tab Cut: 1/5; Color(s): White; Tab Material(s): Durable Paper. 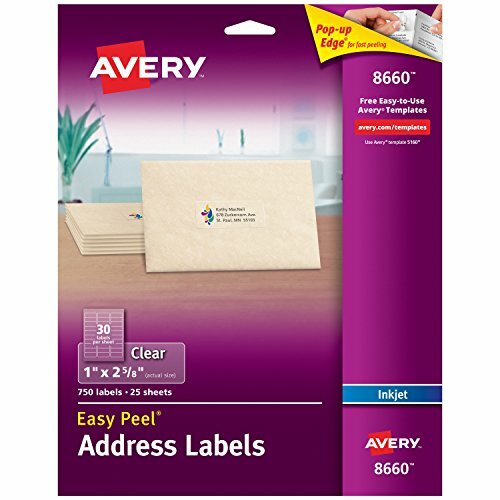 Avery Easy Peel Permanent-Adhesive Address Labels create labels with a professional, printed-on look. Perfect for special occasions. Labels virtually disappear on colored and textured surfaces. 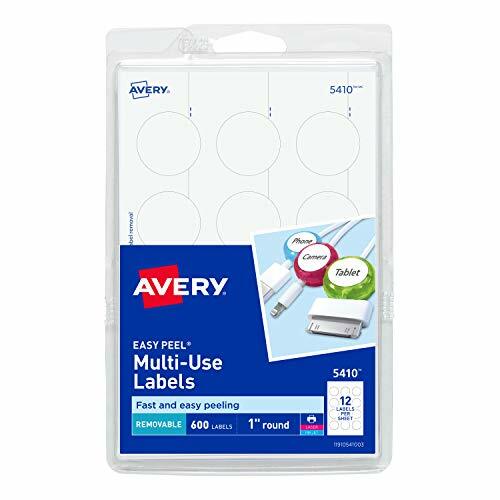 With Avery's patented Easy Peel label sheets, just bend the sheet to expose the Pop-up Edge for fast peeling. The sheet stays intact and goes back to flat. Easy to customize with free templates and designs at Avery Design and Print Online (avery.com/print). 8-1/2 x 11 inch sheets for copiers and laser or inkjet printers. Adhesive allows durable tabs to be repositioned when applied but become permanent over time for security. 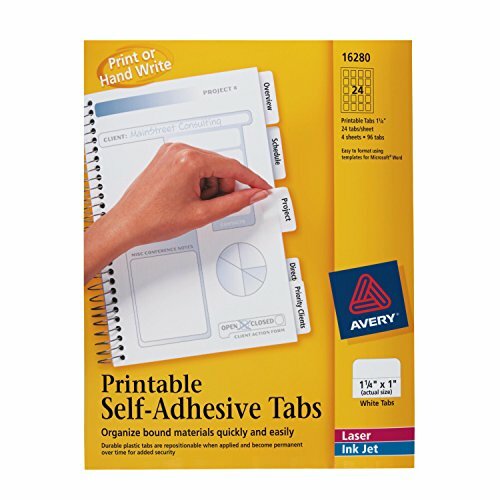 Handwrite or use your laser or ink jet printer to print on front and back of tabs. Easy to format with templates in Microsoft® Word. 1-1/4" x 1" tab size. File Insert/Tab Type: N/A; Global Product Type: File Inserts/Tabs; Tab Cut: N/A; Color(s): White. 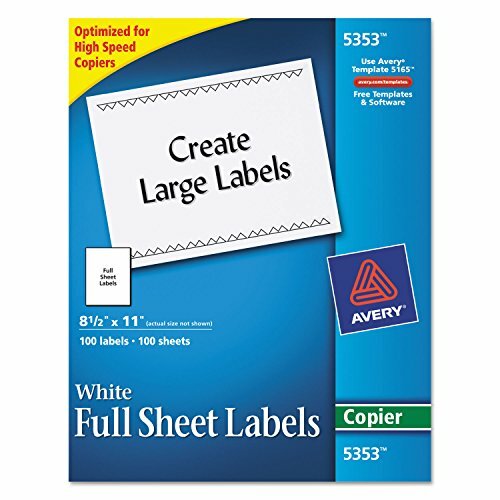 Averyamp;reg; - Self-Adhesive Full-Sheet Shipping Labels for Copiers, 8-1/2 x 11, White, 100/Box - Sold As 1 Box - Simply type a master list once and copy onto multiple sheets of blank labels to create as many labels as you need. Simply type a master list once and copy onto multiple sheets of blank labels to create as many labels as you need. Labels feed easily through most popular office copiers. Easy to customize using free Avery design tools and templates. This product was made from wood that came from a certified managed forest. Label Size - text: 8 1/2 x 11 Label Colors: White Machine Compatibility: Copiers Materials: Paper. 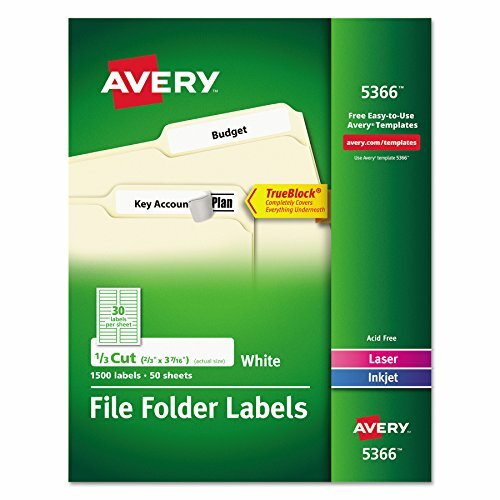 When it comes to file folders, these Heavy Duty Plastic Sleeves present a clear alternative. 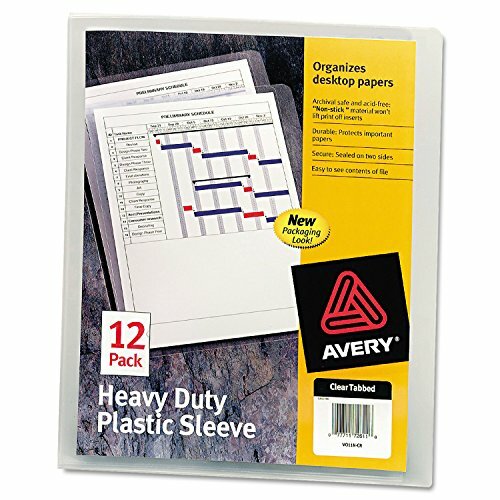 Constructed of durable plastic, these sleeves help you organize and protect your important paperwork so it doesn't get mangled or lost in the shuffle. Each sleeve is sealed on two sides to hold loose papers snugly. The edge of the translucent matte back cover extends for convenient handling or storage, and a notch in the front cover lets you easily grasp the papers inside. The transparent, nonstick cover won't cling to your papers and peel away the print, so your documents are always protected, and in clear view. Sleeves hold up to 20 sheets of 8 1/2 x 11 paper. Sleeve & Jacket Type: File Jacket-Tabless; Material(s): Polypropylene; Height: 11"; Width: 8 1/2". Labels stick, stay and remove cleanly without leaving a residue! Ideal for drawers, containers, boxes, shelves and other smooth surfaces. Global Product Type: Labels; Label Type: Multi-Use; Label Size - text: 1" dia. ; Design: N/A. 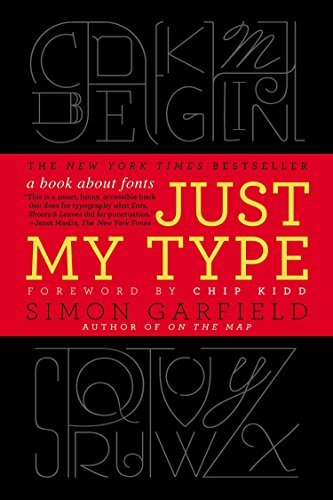 Shopping Results for "Avery Type"